Dollops of Diane: Stop and Shop's Frozen Promotion! Have a Frozen lover in the house? Well don't miss out on this promotion from Stop and Shop! Shoppers at Stop & Shop in New England have an exclusive opportunity to get Disney’s Frozen-themed merchandise as part of a three-week, mail-in promotion. 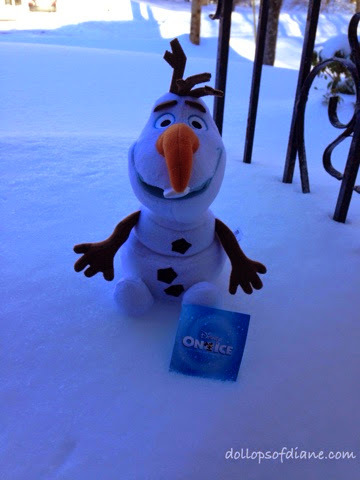 The promotion is in connection to Disney On Ice presents Frozen presented by Stonyfield YoKids Organic Yogurt at the TD Garden in Boston from Feb. 13 – 23, 2015. Shoppers who purchase $25 of participating P&G products at Stop & Shop can mail away for different Frozen merchandise each week. This includes a collectible Elsa or Anna doll, a Frozen fleece blanket, and a plush Elsa or Olaf doll. In addition, select Stop & Shop locations will feature a colorful Frozen display along with balloons, prize wheels and coupons. Each week from January 30th through February 19th customers who purchase $25 worth of select P&G products, including Bounty, Pantene, Puffs, Crest and Tide at Stop & Shop locations, will receive a mail-in coupon at checkout to get the select Frozen merchandise for that week. For the first week, customers could receive either the collectible Elsa or Anna doll. During the second week, the promotion prize includes a Frozen fleece blanket, and the third week’s offering is a plush Elsa or Olaf doll. Click HERE to find out more about the promotion and to find a participating store near you! *Disclosure: We received complimentary Frozen merchandise. As always, all opinions are my own.